Running out of storage is perhaps second on the list of mobile device owners' pet peeves behind, of course, a dead battery. Most of us have been in that position where, upon trying to install an app or download a video, the dreaded pop-up kindly informs us that the system is out of free space. Although manufacturers are increasingly trying to stifle the idea of expandable memory, microSD slots are still fairly prevalent, offering invaluable respite at a time when millions of apps are available to download. If you're in the market for a microSD card for your device, there's a limited-time deal on Amazon pushing a 128-gig card for just $71.99. That's an incredibly low price, and if you like to hoard music, videos and apps, may be an investment worth making. 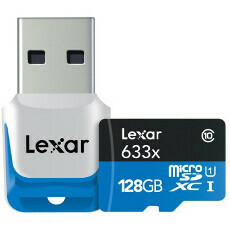 The Lexar MicroSDXC 633X is a high performer despite the price, boasting up to 95 MB/s read speed. It comes with a USB 3.0 adapter as well, so you can readily hook it up to your computer or any other device lacking card-reading facilities. If you aren't looking for so much real estate, Lexar has a number of other storage options currently on offer. The 64 GB version is down from $94.99 to $31.99, the 32 GB edition has dropped from $50.99 to $23.95, and the 16 GB variant has been reduced from $33.99 to $17.95. With a saving of $88 over the usual price, though, that 128 GB offering looks very tempting indeed. At the time of writing, the deal has just over 15 hours left to go, so if you want to get involved, act quickly. Needless to say, these could well sell out before the allotted discount window has closed, so grab yourself a real bargain at the source before somebody else does. I just order 3 pieces of Sandisk Extreme Pro 64GB from Amazon. I think write speed is very crucial for the impatient like me. Its also important when 4K video recording get more popular. Nice profile picture you got there. Why thank you, they other guy retaliated by doing the same to me, but I think he could have done a better job. I noticed that you are without a profile picture, you should join in on the fun! Well, originality had never been his forte. He just copies and claims it was his idea. Why does that sound so familiar....? Yeah, and it's a darn shame too, I would really like to talk crap to someone with an actual functioning brain. It'd make things more fun around here. Question, at my current rate, how long do you think it'll take me to get banned for good? Or do I need to cross some more lines first? lol. Does he claim that the stolen ideas are "revolutionary"? lol. I bought that one before. It is a very good card. I bought it when it first came out and I paid $110 for it. Nice to see the price drop. The only problem I had is, when you put the card inside the adapter and put it in a USB 3.0 port, it gets really hot. Be careful. Damn, it's an older phone though with an 801 processor and running Android 4.4.4, I doubt it'll ever get 6.0. But yeah, it would have been an awesome phone to buy if i was in the market for a new device when it was first released. Nice find! Damn, just bought TWO 128GB Sandisk MicroSD 80MB/s cards for $70 USD and they've already arrived here in Canada...oh well, I'll purchase two of those and demand a refund from Sandisk. EDIT Make that $60, I'll keep the savings. Would be good if it weren't for all the phone manufacturers trying to get rid of micro SD slots and charging hundreds of dollars extra for a 128gb model. nice one for those who need to record more 4k videos on their new i6s 16GB.. oh wait..